All photos and written content is protected by copyright and can not be used or removed from this site without prior permission of the owner. Finally have a full photo of my Sarah Evans Quilt. It is fairly close to the original quilt which was made in 1806. I have been teaching this as a class in Taree this year. 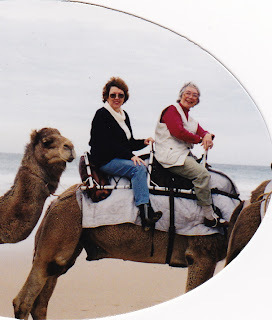 Mary Ellen and I, in July 1998 on Light House Beach. One crazy lady to be missed. The Passing of Mary Ellen Hopkins, an amazing quilter. This is from Diana Marshall who like myself in tje US, took care of all Mary Ellen's Australia lectures. Wonderful sentiment.. The wonderful Mary Ellen Hopkins passed away, July 9 after having a stroke about a week ago. She was with her beloved son David at the time. I think she was 83yrs old, remembering age was her funny secret. Mary Ellen was a gift to the world of patchwork, she changed the approach to allow us to make quilts for now and to be used by everyone. 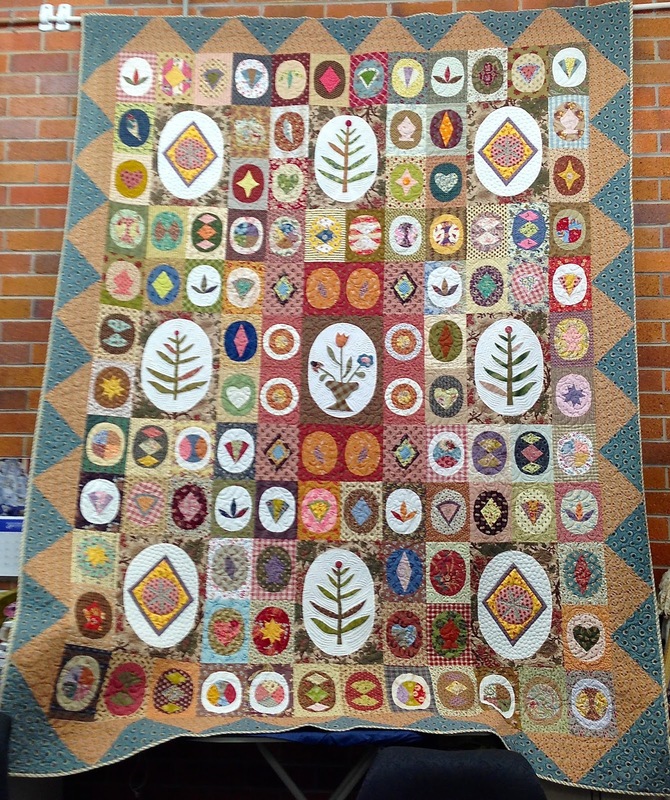 You could certainly sit and touch all of her quilts. 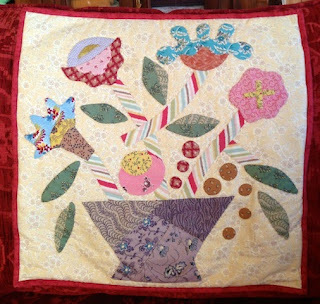 She took a refreshing approach to the everyday quilter. She allowed us to use our own Personal Private Measurement, to use a connector to make triangles easier, she never said the corners had to meet, points took holidays and our blocks would always go together. She relaxed the rules on colours and tone and print. She gave ugly fabric a new leash of life and had an amazing ability to make what appeared an odd stash of prints into a truly exotic quilt. Mary Ellen was an entertainer who used an amazing range of stories from her life, her shop, her customers, her students and her life that kept everyone in stitches even if we had heard them before. She loved performing, teaching, people and life and we all loved her. Mary Ellen has touched us all and for those who attended her lectures or workshops I know her legacy as a great woman who quilted will live on forever. The Rajah Quilt a piece of Australian History. DOZENS of women are crammed beneath the decks of a ship bound for Van Diemen's Land struggling to weave their needles against a poor light. That's how amateur genealogist Bernadette Dewhurst-Phillips imagines life on board the Rajah, which set sail from England in 1841 with 180 convict women. Most of the women had been convicted of larceny, including her great-great-great-grandmother Grace Stevens, who later became a Dewhurst when she married into the family. The women were given needles, thread and fabric by the British Ladies Society for Promoting the Reformation of Female Prisoners, a Quaker organisation founded by prison reformer Elizabeth Fry. The sewing tools, designed to keep the women busy on the 15-week journey, were used to produce a magnificent quilt, presented to Lady Jane Franklin, wife of the lieutenant-governor, when the ship arrived in Hobart. Then the quilt literally vanished from history. More than a century later, in 1987, it was rediscovered in an attic in Scotland and then bought by the National Gallery of Australia. The Rajah Quilt will be shown on loan from today at the Queensland Art Gallery as part of an exhibition of quilts from London's Victoria and Albert Museum. About 20 pairs of hands are believed to have sewn the quilt; who they belong to is a mystery. 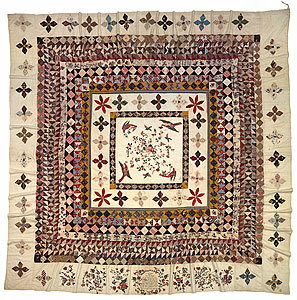 Dewhurst-Phillips, 48, is a keen quilter and knew about The Rajah Quilt long before she discovered her connection to it. She keeps a blog - Rajah's Granddaughter - about her family history and likes to think Stevens was sewing on the ship. "It is really exciting to think Grace had been on the Rajah, although there is no way to tell if she had anything to do with the quilt," Dewhurst-Phillips says. "It's still mysterious." Stevens was a red-headed, blue-eyed 16-year-old with a scar on her left thumb when she boarded the ship with two convictions, both for stealing pieces of fabric. "It does make me think quilting runs in the family - but that's only a guess," says Dewhurst-Phillips with a laugh. "My gut feeling is that she would have been involved in making the quilt." The quilt has connected Dewhurst-Phillips with Tasmanian historian Trudy Cowley, who wanted to know about Stevens for her new book, Patchwork Prisoners: The Rajah Quilt and the Women Who Made It. Cowley and co-author Dianne Snowden have been nutting out theories about who made the quilt and have produced a list of 45 convicts - listed as having sewing skills on departure or arrival - who they believe could have sewn it. Stevens isn't on the list but Cowley says, "it doesn't mean she wasn't sitting around with the other women, watching [the quilt being made]". In her imagination, the women on the ship are gossiping as they sit in a circle on the deck, snipping pieces of fabric and stitching their threads. "They wouldn't have made it in the dark because they wouldn't have seen the stitching," Cowley says. "They were only stuck downstairs at night and when the weather was bad." Cowley and others believe the ship's young matron, Kezia Hayter, oversaw the design of the quilt because she was put in charge of keeping the convicts occupied and well-behaved. "Kezia would have realised that sewing skills were important to women in the colony, so she may have taught some of them," she says. "She had quite a genteel background and some of the skills ladies learned back then were embroidery and patchwork and sewing." Hayter fell in love with the captain of the ship, Charles Ferguson, and kept a diary of their romance after she arrived in Tasmania. The quilt may have made its way back to England on the Rajah's return trip. "Because Ferguson was Scottish, it may have gone back with him," Cowley says. "But we don't really know." Debbie Ward, head of conservation at the NGA, has spent more than 500 hours studying the quilt and says it is in remarkably good condition. The seams, however, are thin and put under tension whenever it is displayed, so it is usually shown for only about one month a year. "It is classified as one of the most significant works in the textiles collection and it would have to be the cheapest one," Ward says. "We probably have more requests to see it than a lot of other things in the collection." Most of the quilt is made from the type of cheap cotton fabric used in fashion house samples, although some of the flowers and birds are cut from expensive chintz. Ward suspects Hayter told the women to make the quilt. Although the quilt has a glowing inscription, Ward can't imagine why the convicts would have made it on their own free will as a gift. "If you were given a couple of metres of fabric to make things to sell en route or [for yourself], there is no way you would want to give that up to some rich little lady when you arrive," she says. "We not talking here about people who are grateful to be sent to Tasmania." Some of the stitches are 1cm long - which would attract the wrath of a sewing teacher - while other parts of the quilt display better technique with 16 stitches to the centimetre. And some of the pieces have been sewn in backwards which makes Ward suspect "that some of the sewing was not done with best lighting". Meanwhile, Dewhurst-Phillips is working on a hand-applique nativity quilt that she hopes to complete in time for Christmas. Quilters, she says, are notorious for having piles of unfinished projects in the cupboard, snipping up squares of fabric for more than one quilt at a time. When she saw The Rajah Quilt for the first time in the exhibition Not Just Ned: A True History of the Irish in Australia two years ago at the National Museum of Australia, she was amazed at its colours and vibrancy, having seen it only on the internet previously. Like the northwest coast of Tasmania where she lives and where Grace Dewhurst is buried, the quilt connects her to her past. Nobody knows exactly who made The Rajah Quilt, but it doesn't really matter. "There are hundreds of descendants of Rajah convicts living in Australia," Dewhurst-Phillips says. "But the quilt makes it more interesting." Quilts 1700-1945 is showing at Queensland Art Gallery until September 22. Patchwork Prisoners: The Rajah Quilt and the Women Who Made It by Trudy Cowley and Dianne Snowden, published by Research Tasmania, will be launched on July 19. An extra centre block for "Geese In The Garden". To live a creative life, we must get over our fear of being wrong. If you see someone without a smile, give them yours. Treat every stressful situation like a dog, if you can't eat it or hump it, then piss on it and walk away. Please have a little patience as my medication hasn't kicked in yet. Copyright © Leigh Latimore.. Simple theme. Powered by Blogger.